Growing up in the United States, I always knew I had certain unalienable rights: life, liberty, the pursuit of happiness, and the right to pee for free. Many establishments, such as grocery stores, don’t have public bathrooms at all. Other places, like restaurants, have attendants sitting outside bathrooms with a little dish where you’re expected to leave a tip. Still other places have completely commercialized the whole process. If you stop at a rest area on the Autobahn, expect to drop a few coins into a turnstile before you will be permitted entry. Instead of a train ticket, you get a voucher you can use towards a cup of coffee…talk about job security. The going rate for pee breaks in Germany is 70 cents (in Euro), so if you’re planning to travel here, be sure to budget in potty tolls because to pee is not free! P.S. Take a good look at the photo above. 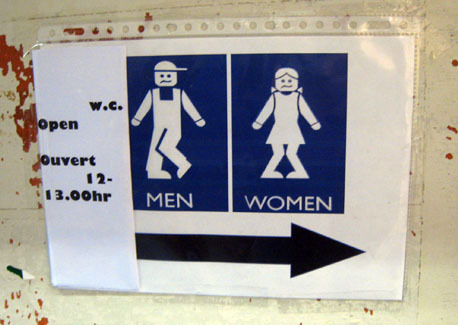 Does this mean you’re only allowed to pee between noon and 1pm?